you can get it directly from the Ecosystem now! Basically, there is two proxy components that you create either during authoring or during runtime ( custom actions available to do so right within playmaker). Then with a full set of custom actions, you can do everything you normally do with arrays and hashtable but within playmaker. The good thing is that the array and hashtable proxy component feature a custom editor so that you can pre fill content during authoring, making it very easy. I originally planned to release this on the asset store, but I have to be realistic, this is not the right time for me: I would not be able to provide a good enough support. when I will get some downtime work wise, It might make it with some more goodies. Several samples are available with this package using most if not all the custom actions, some are just "unit test" to make sure the system works as expected, some xample are more "fun to watch" like "PlayMakerSamples/Addons/ArrayMaker/ArrayList/GameObjectPositionning"
This sample creates as much cubes as you define in an array ( using a position), and also set it's color again from a another array. As they fall, each cube set back it's position to the array, so that you can watch in real time the position of cube being set in that original array. Furthermore, if you modify the colors from the array, the related cube will update its color in real time! ( note, in the unity preferences, uncheck "use OS X color picker" for an even more granular color update, the osX picker only update when you mouse up on the a color, not while you are mouse down). If you have any questions, use this forum and put in the title "ArrayMaker"
There are few more things to do like help sections for each custom actions, screencasts to explain the basics, and generally some script improvements ( not happy with many aspect of it, so lots of room for enhancements). Look forward to playing with it this week. Very cool Jean! You are awesome for sharing this with everyone for free. I know if I start using Arrays in my game it would speed up the creation and modification of a lot of stuff. Woa, you've been busy. So much for time-off. Well done. Thanks! Very motivating to hear your comments! I still think that the custom editor for the array proxies need a more flexible interface for creating, editing, organising, and deleting content during editing, and why not when playing too. But at the same time i'd like to also build a xml proxy with some xpath support for reading, accessing and creating xml, that would be very very cool! A database proxy also would be nice... So much to do! I have also at the back of my mind an fsm exporter that would render in html 5 for easier sharing of content, so that we can better show and share fsm stuff conveniently, and also be able to provide some kind of documentation system for what we build inside playmaker. Gotta love Playmaker for allowing open integration like this. And of course nice add-ons like arraymaker! I think thats why I love it so much. Such simplicity and such power! Muuah-ha-ha! New version of ArrayMaker with a new sample for a word search featuring the new text asset split system. Holy smokes this just gave me a thousand game ideas! And wait, more is coming, like csv and xml parsing, xpath etc etc, so that basically data handling in playmaker becomes natural and fun. would you be able to put together a tutorial or detailed lesson plan to help teach us how to use it to it's fullest? Yes, I seriously need to allocate time for this and create a step by step tutorial and a screencast as well. Meanwhile you might have specific problem? Have you been able to attach a array component to a gameObject? Have you been able to prefill the array with values? 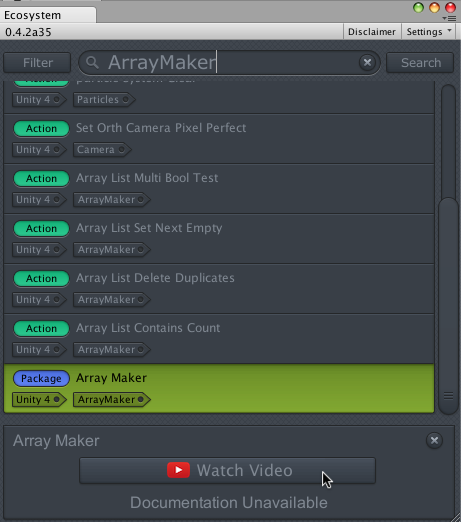 Have you been able to find and use any of the custom actions related to working with arrayMaker? for example counting the number of items in the array? or maybe you are already further and need explanations on design patterns? In there you have several scenese ranging from test cases to more advance usage. I am not trying to get away with this instead of making a tut or a screencast, I just want to know where you are stuck so that I can better target the tutorial level of explanation and possibly help you out the best I can right now. well, for starters, whenever i try to create/use the arrayMaker features, it keeps throwing an error saying "GameObject requires PlayMakerArrayListProxy component." even when copying and pasting the FSMs from the example scenes. Does the gameObject in question indeed has such PlayMakerArrayListProxy component? If not, select that gameObject in question, then add such component via the menu (PlayMaker Add ons/ArrayMaker/Add ArrayList Proxy to selected Objects). Then you'll be able to enjoy all the related custom actions ( that is actions listed under "ArrayMaker/ArrayList"
If you do actually have that component, make sure the reference field is either empty or if set needs to be stipulated in the action you are using. This is used when several similar component feature on a single GameObject to differenciate them. Else, what feature exactly are you trying to use?